The first look images of Surya in 7am Arivu has taken Kollywood by storm. It is not only Kollywood but other neighboring industries too are very keen about the films release. The filmmakers revealed the look of Surya after keeping them under wraps for more than one year. The Chinese monk look of Surya clearly shows an angry monk with six pack abs. His eyes and body language sends the message across that it is an action movie. The idea and ad design by the creative team is appreciated by one and all in the industry. The latest news is that the role of a Chinese monk would last for only 20 minutes in the film. 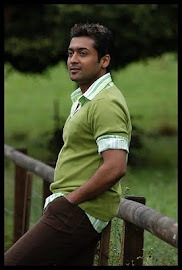 If reports are to be believed that Surya will be seen in this role during the early scenes of the film and later his other avatars of a scientist and circus artist carry the film forward. The entire team of 7am Arivu were astonished by Surya’s looks and performance in the film and especially his circus stunts will surely appeal the audiences. 7am Arivu is directed by AR Murugadoss and Shruti Hassan and Hollywood artist Johnny Tri Nguyen play in the leads. The movie is produced by Udhayanidhi Stalin on the banner Red Giant Movies.